My First Blog Hop~ ! Today I saw her tweet about Blog Hop Wednesday, sounds cool I thought, now what the heck is it? It’s brilliant that’s what it is! It’s a way to look at other people’s blogs and learn a little more about where they are from. This week the theme is traditional foods where you live …. well I live in Columbus Ohio. Most people in Columbus would list the traditional foods here as anything that you can tail gate at a Ohio State University football game ! But seriously to try to mention a traditional food would be hard since our city is a melting pot of culture and there is so much to choose from. 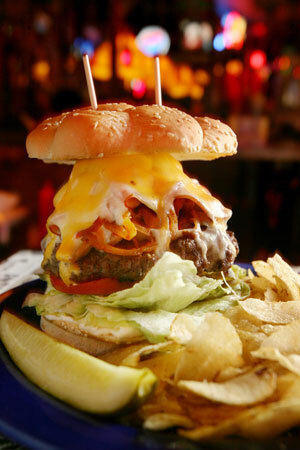 SO although not a traditional food Burgers are loved but most and because of this fact; I have chosen to showcase the Thurman Burger at the Thurman Cafe in German Village (since 1942 HELLO that’s 59 years~! ) 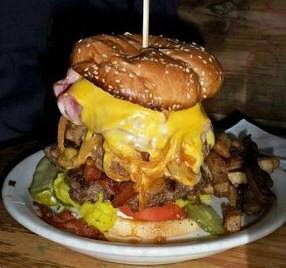 a lot of people rant and rave about this burger now at the end of my post I will let you know how I like my burgers** . Not only has their Thurman Burger voted the Best in Columbus in several media outlets but they have a challenge burger called the Thurmanator that was featured on Discovery Channels Man V Food ( I love that guy that does that show I want to squeeze him!) so here’s a looky at that one too! This entry was posted in Blog Hop !. Bookmark the permalink. ← Winter Wonderland the newest iHeartFaces contest! Wow those are some amazing cheese burgers!